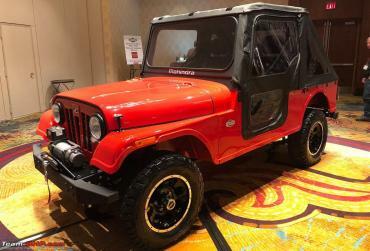 Earlier this year, Mahindra unveiled the Roxor - its first all-terrain vehicle for the US market. Now, a media report suggests that the company will be investing up to a total of US$ 1 billion for expansion and launching new models. The Indian company has received a grant of US$ 800,000 and US$ 1 million worth job-training subsidies. Local governments have also provided support for the first new investment in the Detroit region after over 25 years. The carmaker has invested US$ 230 million in the new facility, which has an installed capacity of 10,000 units at present. Depending on the response that the Roxor receives, the company will decide on future models. The company claims to be looking at building a line-up of cars for the US market based on the existing Indian products and tweaking them for the local regulations and specifications. Expansion plans include additional investments of US$ 600 million and job creation for an additional 400 employees. Mahindra is also one of the four companies in a race for a US$ 6 billion US Postal services delivery vehicle contract. Details regarding its dimensions as well as the planned engine and gearbox combinations were revealed in October 2017.